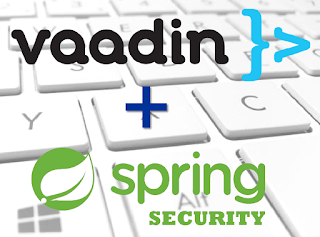 Today I'm going to write a little bit about my experience of trying to secure a simple Vaadin application using one of the most popular security frameworks: the security extensions of SpringFramework. This post will cover the part of configuring a default setting to make it work, of course after this, there are a lot of things to do in your project to finish implementing this, such as storing and retrieving your user details from the underlying datastore of your choice, choosing the password-hashing algorithm, and so on. But at least you will have an overview of what needs to be done to accomplish this. After this, you're ready to go with the rest of steps. This will add all of the required dependencies that you're going to need to implement this. We are considering using 4.2.3.RELEASE, that is the last stable version of that part of the framework at the time this article was written. And also, we are using Vaadin-Spring addon version 2.0.1 (latest stable version). getUsername & getPassword: This methods should return the stored username and password of your logged in user. User Service: Is the class responsible for loading the previous model from the underlying database. In this little example, this class is just creating and returning a new simple User. Through the method authenticationProvider(), we are configuring the previous service as the mechanism to retrieve the user from the database. The method configure() is the most important one, and allows a lot of configurations to be set. We are using the minimal ones to allow some unprotected url patterns (like the login form page) and restrict everything else to allow only the access to logged in users. We are also setting some standard configurations regarding the session utilizing the method sessionControlAuthenticationStrategy(). Another interesting thing is to create a Session Registry, that is a class that will allow spring to store the security sessions detail in memory. Finally there is a method encoder() that will allow you to hash the password, so no plain password are going to be stored on the database. Just because this is a simple example, we are using a NoOpPasswordEncoder. SecurityWebApplicationInitializer: This class will be responsible of assigning the class SecurityConfig as the base class of spring configuration. LoginUI: Because we are going to secure some urls, and others are going to be left unsecured, we need to create a new UI, that will render the login form. In this class we are using one interesting Vaadin component: the LoginForm, this will render a login form in vaadin using some interesting features like being able to tell the browser to remember the user credentials. Finally we have to modify the MainUI, a little bit to allow using a SpringVaadinServlet instead the default one. And also we are adding a logout button, that will be doing the logout process, invoking some class of spring security. After adding this classes you're ready to go and test the application. If you try to access to the default url, you're going to be redirected to the LoginUI and your credentials are going to be asked. Just enter "admin" as username and "admin" as password and you are going to be granted the access to the application. After that if you click in the logout button, you are going to be logged out of the application and then be redirected to the login page. That's it. All of the sources are uploaded into a small github project so if you want, you can take a look there. If you have any issues please comment! Hope this could be useful to someone.